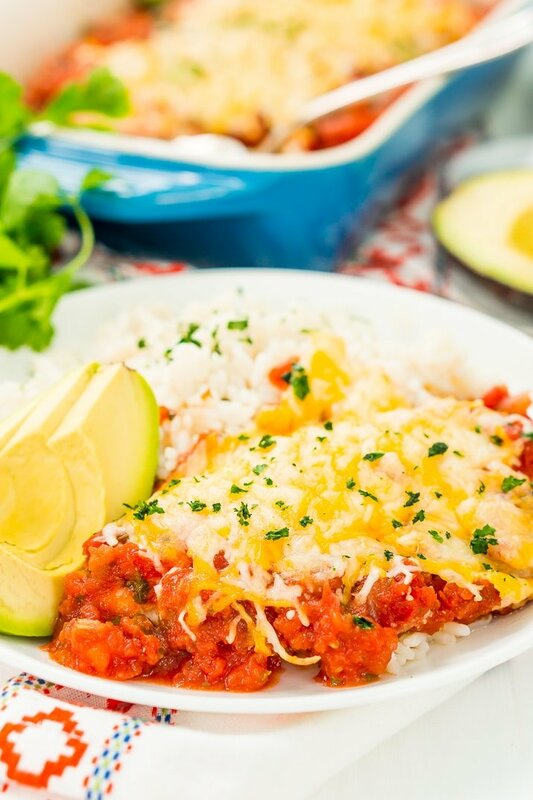 This Salsa Chicken Bake is a mouthwatering and easy dinner recipe loaded with flavor and made with just chicken, taco seasoning, salsa, and cheese! 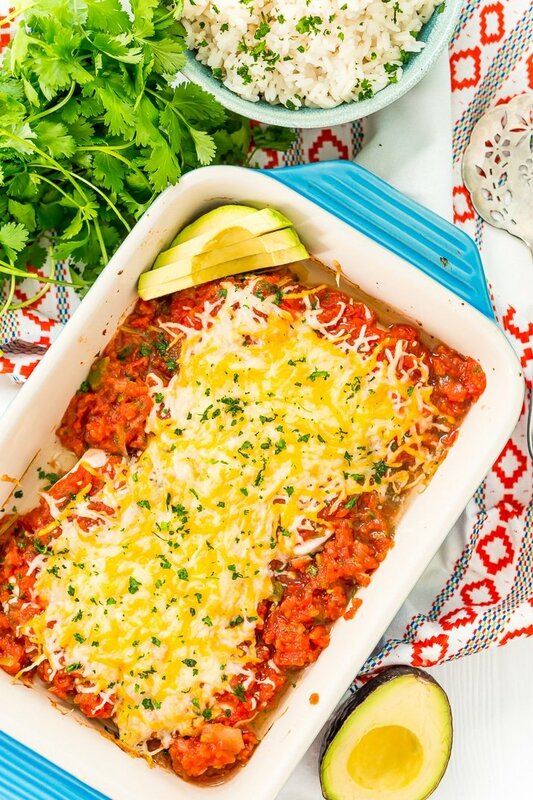 This Salsa Chicken Bake is the perfect no-fuss, easy, and downright delicious weeknight meal! The best part: 4 ingredients. FOUR! And it’s crazy tasty for just 4 ingredients! If you want sour cream and cilantro, that makes it 6, but that’s entirely up to you, although I highly recommend it! This is one of my favorite dishes to add to our monthly meal plan rotation along with my Alfredo Recipe, it’s loaded with flavor and you don’t have to be a chef or even a good home cook to make it! It’s seriously THAT easy! 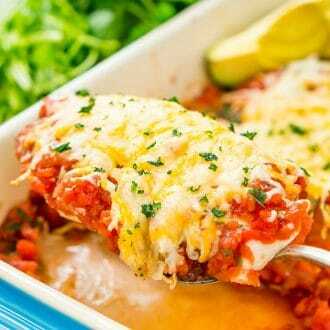 What Ingredients are in Salsa Chicken Bake? 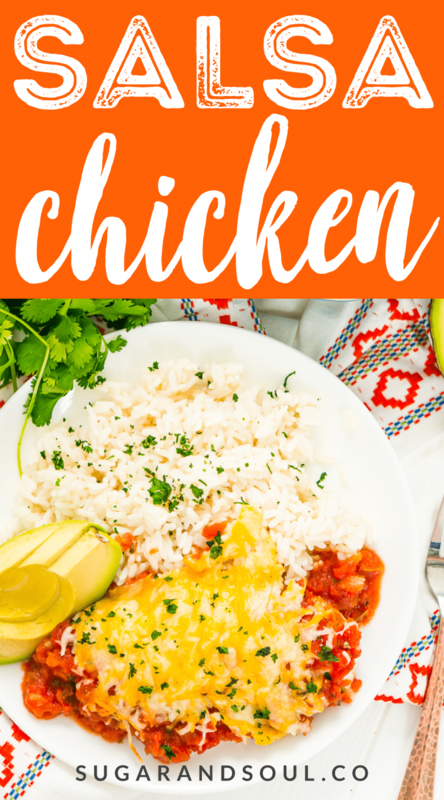 This easy dinner recipe starts with Chicken Breasts which is always a family favorite protein! Next, Taco Seasoning is used as a rub to add great flavor to the chicken and is then placed in a dish and topped with your favorite kind of salsa! I prefer a chunkier salsa for this dish, but any type will work and whether it’s a hot or mild salsa is entirely up to you! 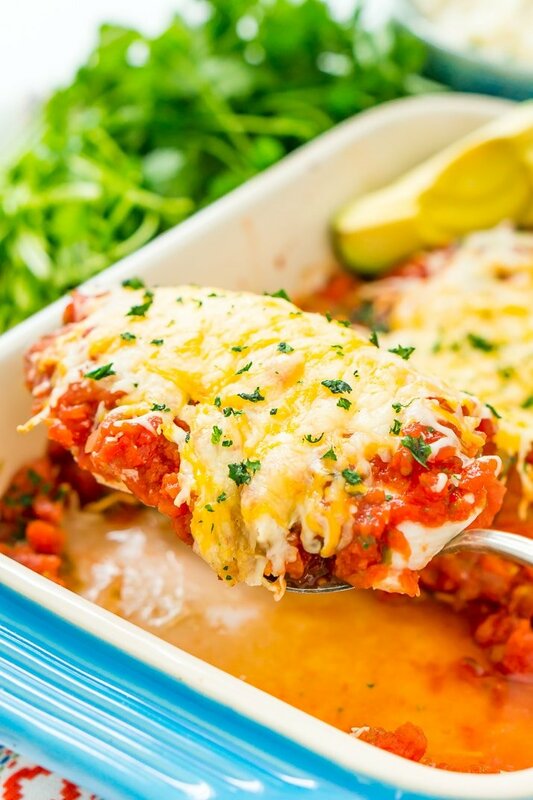 Finally, like many great casseroles, this recipe is topped with Cheddar Cheese (but you can certainly use your favorite, a Mexican Cheese blend would be great too. One great thing about this recipe is that it’s SO incredibly easy to make! Simply season the chicken with taco seasoning. Top with salsa and voila, bake until tender! Just before serving, sprinkle with cheese and broil until melted. Remove from oven and top your favorite toppings, such as cilantro, sour cream, and jalapenos! Spanish rice is a great side dish to go with this recipe! Pin this Chicken Dinner Recipe for Later! Your house will smell amazing before you even pull the dish out of the oven, and that melty cheese and fragrant spices will leave your mouth watering. I recommend serving up this Mexican-inspired dish with a refreshing Skinny Margarita and Spanish Rice. Preheat oven to 375 degrees F. Coat a 9x9-inch baking dish with non-stick spray. Rub each of the chicken breasts with taco seasoning and place in the baking dish. Pour the salsa over the chicken, making sure to cover each piece. Bake for 33 to 37 minutes, or until the chicken's internal temperature reaches 165 degrees F.
Remove from oven and sprinkle cheddar cheese over the top of each piece of chicken, place back in the oven and broil on low for 2 to 3 minutes. Remove from oven, garnish with cilantro and serve with sour cream. Pairs well with Spanish rice. *Calories are calculated without sour cream. This looks amazing! Always great finding recipes that my kids will eat!